Another set from Friday afternoon. 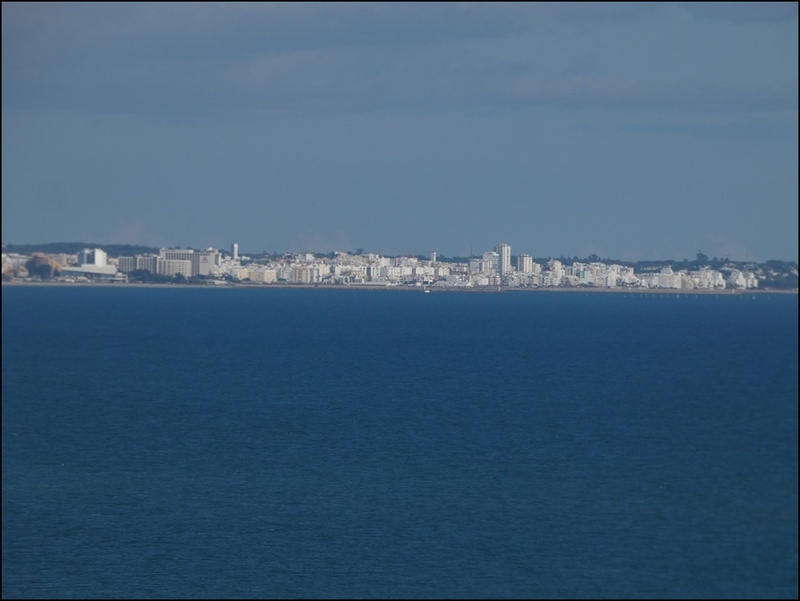 From the vantage point on the far side of the marina here in Albufeira, it’s possible to see right across the bay to Vilamoura (12km / 7.5 miles), Quarteira (13km / 8.1 miles) and even the Praia de Faro (Faro beach on the island) near the airport which is about 24km / 15 miles in a straight line. This new Panasonic camera I bought a few weeks back has about a million functions contained in a 311 page manual! I was basically experimenting with the settings to see what I can do. I bought a tripod for €10 at a flea market, which helps but getting it level is tedious! I must buy a small spirit level. Anyway, here are the results which I shall try to improve some time. 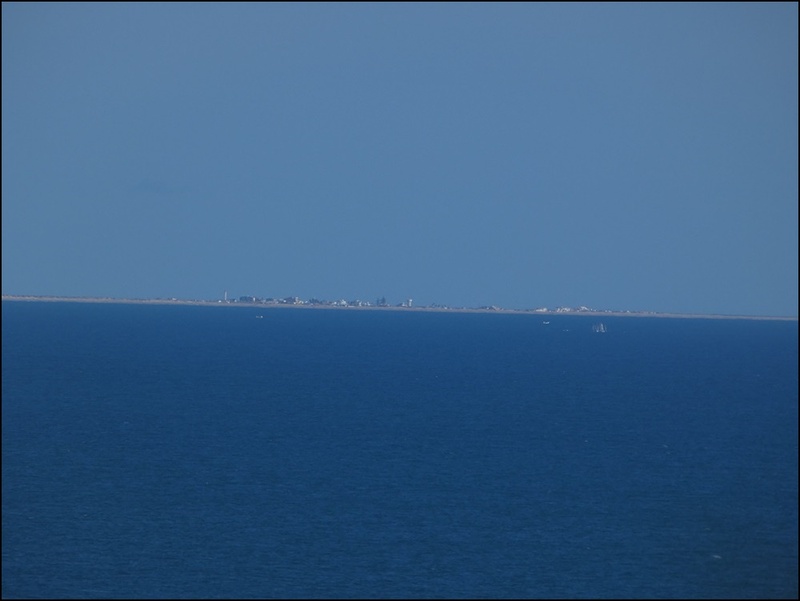 This is the Ilha Faro on which you can just make out the lighthouse. 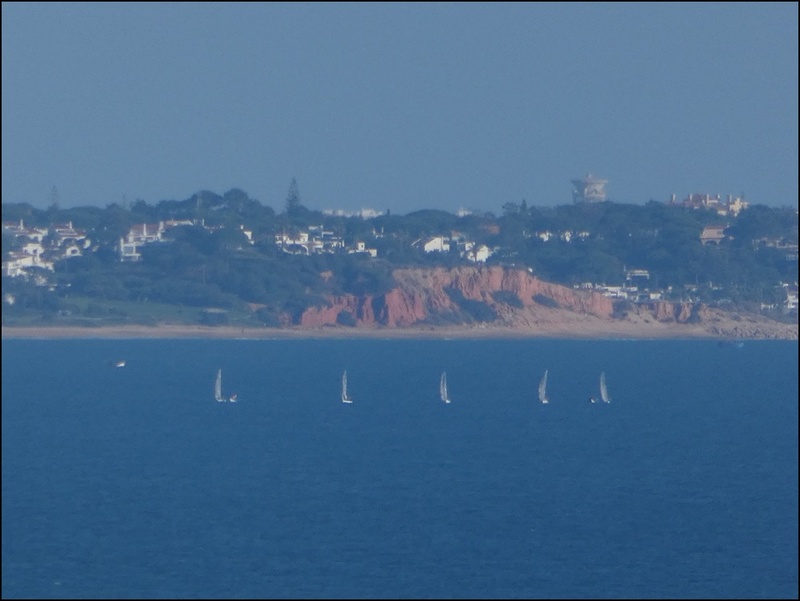 This is the spit of land seen by millions every year as they land or take off at Faro Airport. 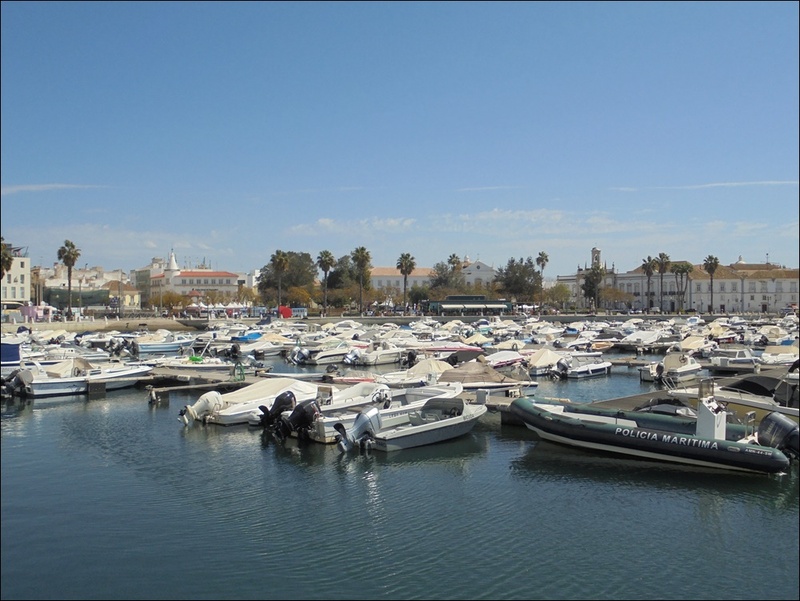 Although often called the ‘Ilha de Faro’ (Faro island) it isn’t a true island as the western end joins onto the beach area of the upmarket resort of Quinta do Lago. It had been a very long time since I had been there. 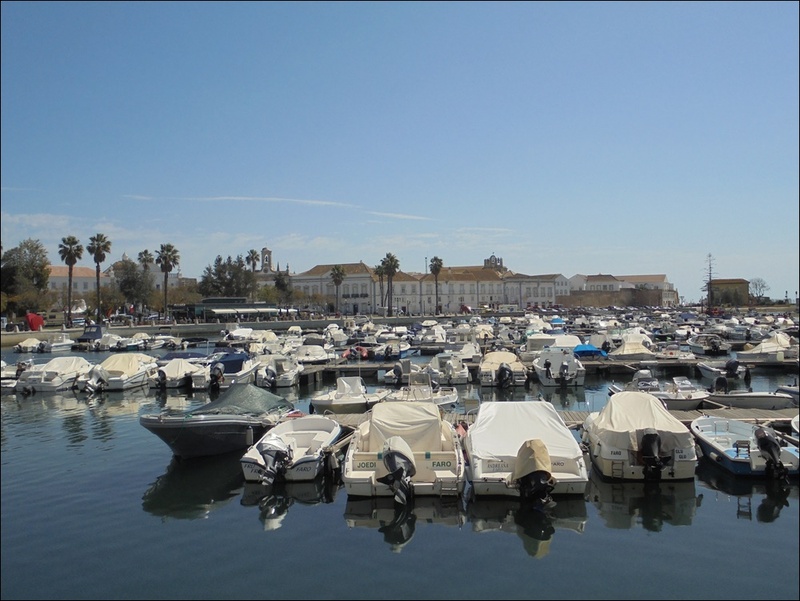 So, on a hot day last Thursday, I took the train to Faro and then the bus to the beach. The ‘island’ is linked to the mainland by a low half mile long bridge. The last 150 metres is, for some unknown reason, only wide enough for one vehicle to pass at a time. It’s controlled by traffic signals, where posters are on display, demanding a wider bridge to be built. Because of that narrow section, large trucks and buses cannot cross onto the island. The bus stops seemingly in the middle of the sea. 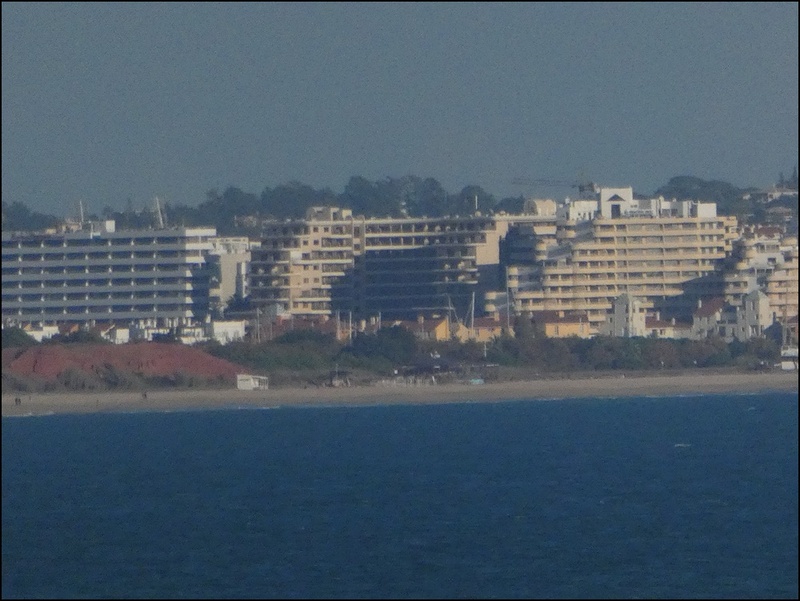 It was a very busy day, the sands were busy. 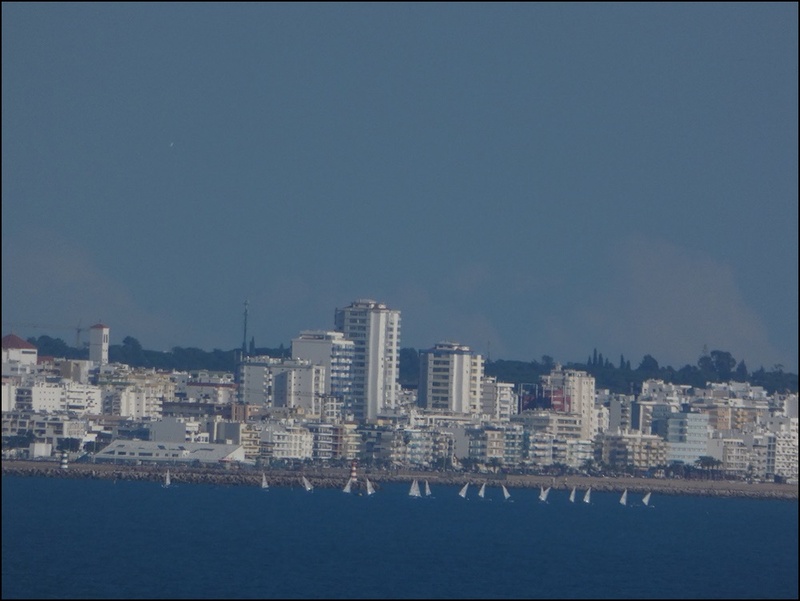 The beach stretches for several kilometres. I walked to the eastern end, about 4 km each way. After the first 1.7km, the road runs out. A boardwalk for pedestrians, bikes and scooters runs almost the whole way to the end, where there is a scattering of houses including this rather smart one. These houses have a boat parked outside the front door and a bike or scooter at the back. 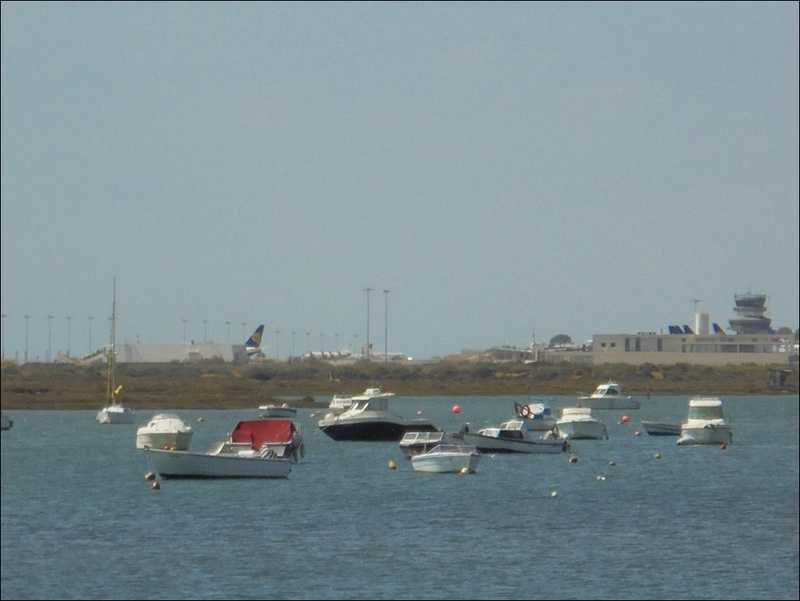 The city of Faro sits across the marshes, as does the airport. Some more pictures if you click the icon below. This map shows my walk, from the red dot where I got off the bus to the blue dot. Despite what the map may show, the road runs not quite half way. There is the boardwalk for most of the rest, then it is soft sand. 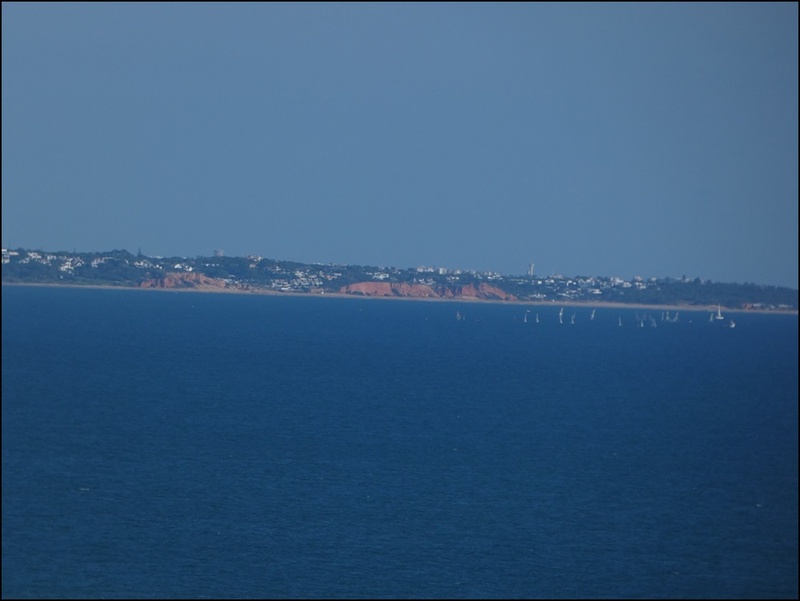 As you can see, the island is a short distance from Faro airport. Take that road and turn away from the airport, following the signs to Praia de Faro. Parking on the island is very limited and with access only via that very narrow bridge it is often a fairly long wait to get on and off. There is a parking area on the mainland at the other end of the bridge. That however is a walk of about 850 metres. Good news is that there is a separate boardwalk type bridge, alongside the road, for pedestrians and cyclists. 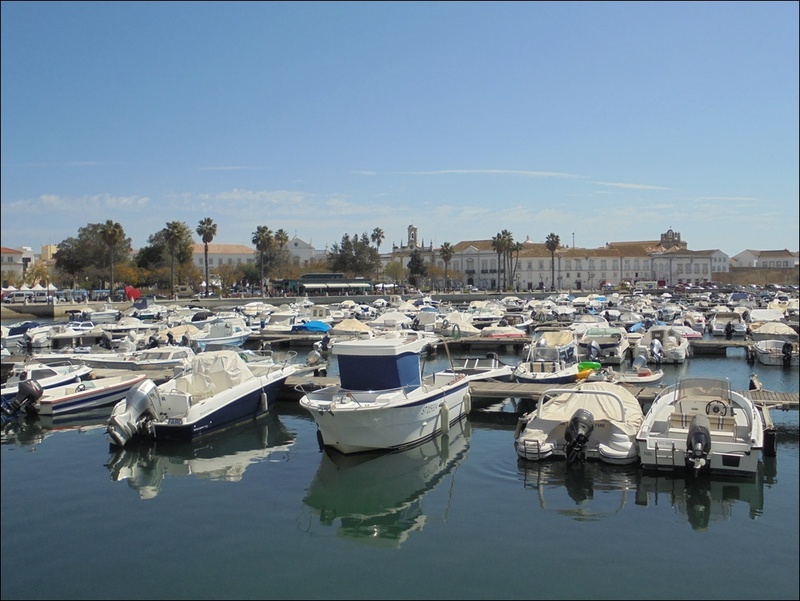 For those who don’t mind going by bus, Faro city bus route 16 runs from the bus station and railway station once or twice an hour. Fare is €2,25 for adults, €1,50 for children. The journey takes about 20 minutes. This is the same bus that goes via the airport. In summer, there are also journeys on routes 14 and 17 from other parts of the city. 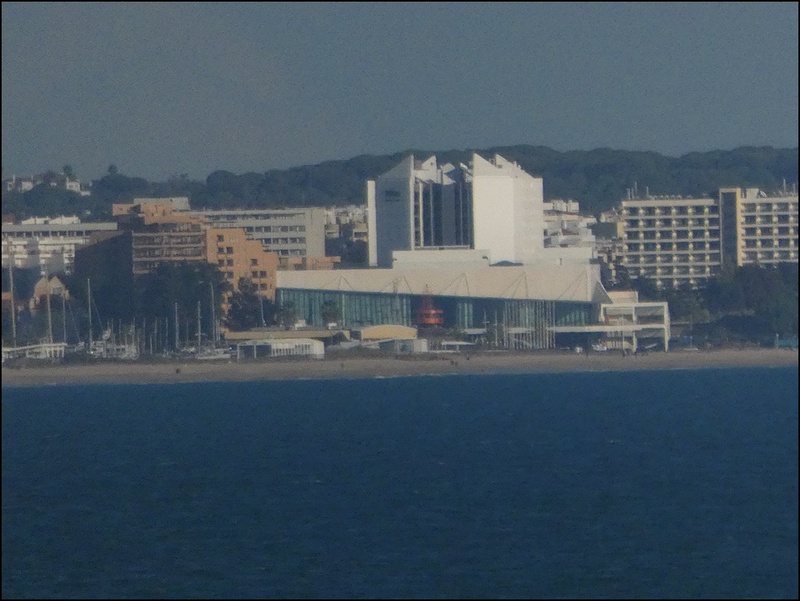 Not very good quality, but I had my camera in hand so took a few shots of things that caught my eye on the flight from London Gatwick to Faro. 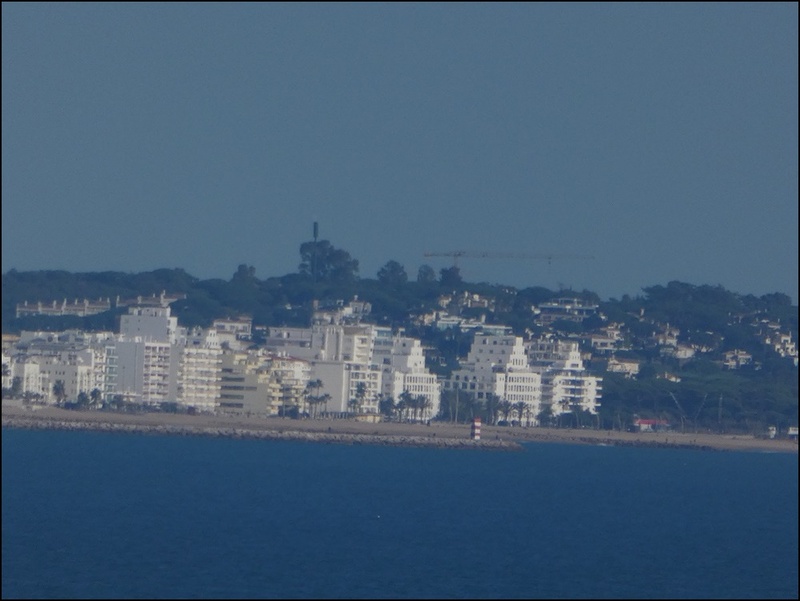 The town of Olhão as we come in to land. 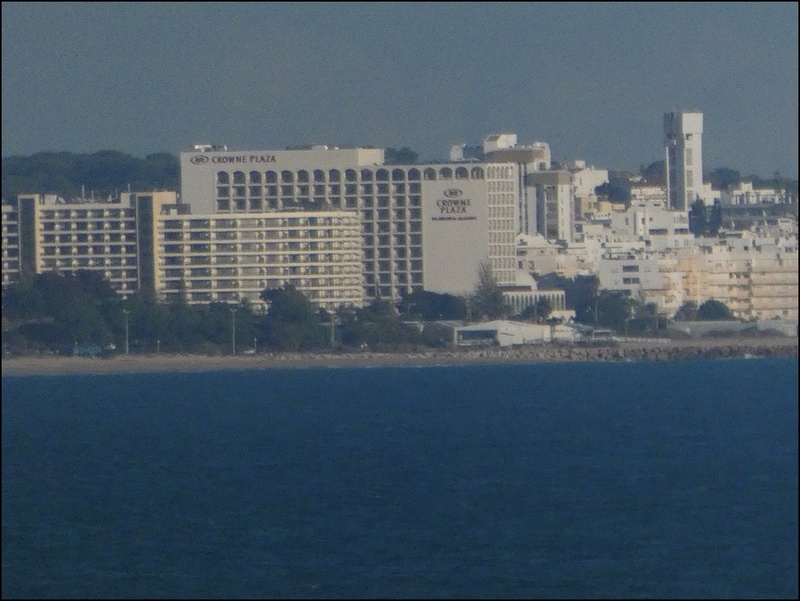 We pass low over old city area of Faro just before landing. I thought I should share this with my readers! Portugal’s Second Division normally plays midweek matches in the afternoons. Such is the lack of interest they would have even fewer fans if they played at night when the Champions League etc are on TV. Average crowd for second tier (Segunda Liga) games in this supposedly football mad country is 850, so far this season. Anyway, on 30th September two local Algarve teams were due to meet in a local derby. Despite protestations from Portimonense that the game should be at night, Farense insisted on a 4pm kickoff. That allowed three of us to go to the game. Two regular visitors, who have become friends plus me of course, travelled from Albufeira to Faro by bus and train as beer was also on the agenda. Steve (who is of course not in most of the pictures), myself (red shorts) and Paul (yellow shorts) enjoyed a sunny afternoon. Steve has put together an excellent slideshow and set of video clips at https://youtu.be/E_hGSQ7fSgg which I think you will enjoy. It is 18 minutes of screen time, so sit down and see what we did on our day out.